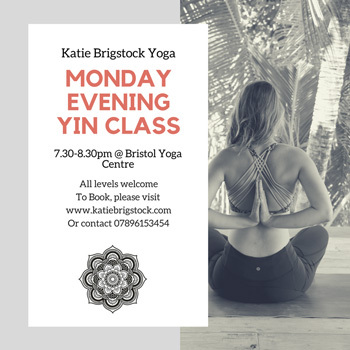 We have a new Monday evening Yin yoga class starting next Monday from 21st May 2018. This class is suitable for all levels of experience. Come and restore your body's energetic balance and find a greater sense of calm through Yin Yoga. Yin Yoga classes are designed with specialised poses that are held for longer periods of time, working your ligaments, joints, bones and deep networks of fascia within the body. Through a Yin practice we aim to balance the active, external and dynamic Yang activities of daily life with a more internal, grounding and calming practice, surrendering to stillness. Yin Yoga helps to improve flexibility, circulation and joint mobility as well as reducing stress and anxiety. Every Monday from 7:30 - 8:30pm. We accept MoveGB students! Contact Katie for more information.